You may call them rental porta potties, while others say “portable toilet rental” or “portable bathrooms” or perhaps “mobile restroom trailers”. Whether you call them a potty rental or something else, please know that Robinson Waste brings to you easy; no hassle Bass River Township porta potty rentals. The Porta Potty Rental Co. Bass River Township Can Depend On! Proudly renting the most dependable and affordable porta potty rentals in Bass River Township, we also provide portable toilets and restroom trailers for rent in many other South Jersey / Philadelphia area towns and neighborhoods. You can click this link to Burlington County area porta potty rentals to find more information on other nearby places we deliver South NJ and Philly porta potties to. What Are Your Bass River Township Porta Potty Rental Needs? If you need a porta potty rental for a location in Bass River Township NJ and you are in construction, or if you’re an event coordinator with big needs, or even a homeowner who needs just one porta potty for a party, call us for your price to rent. Being local, we have fast turnarounds for not only porta potty rentals, but also dumpster rentals should the need arise. Whether renting for a business, an organization or a residential property, we are ready to deliver to your specific Bass River Township site. Don’t Know How to Start Your Porta Potty Rental? Let us assist you in Bass River Township. We gladly will provide free, no nonsense rental price quotes for any porta potty need you might have. Your phone call will be answered by one of our friendly porta potty rental experts who will help you to rent for your project. You will simply let us know what you’re plans are, how many people will be on the Bass River Township site premises, and how long you’ll need to rent the porta potty. 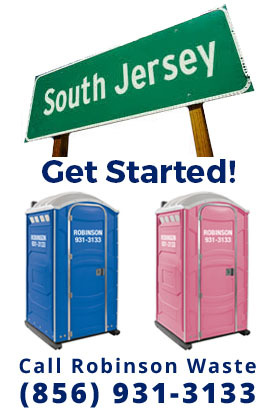 With a variety of Bass River Township porta potty rental options, Robinson Waste can rent portable toilets in either a blue or pink color. From the standard porta potty rental to flushable VIP unit to the wheelchair ADA accessible porta potty unit, you can rest assure that we have you covered. We even have available the sometimes hard to find porta potty elevator/roof top rental units for building construction sites. Go ahead and let us know when you need them delivered. From the initial call to the Bass River Township rental scheduled drop-off and pick-up, we promise you will always receive prompt attention and sound porta potty rental customer service. We provide porta potty rental deliveries for the Bass River Township area and have a portable bathroom inventory and dispatch teams ready to drop-off impeccably clean toilets, sanitization service so they can be used again and again, and punctual scheduled porta potty pick-ups. Do you need a Bass River Township portable toilet rental, be it a standard or wheel chair accessible porta potty? Call us for rental advice and for “over the phone” prices for renting porta potties in Bass River Township NJ. Our team will make your rental experience as simple and as hassle-free as possible. We are always here to address any questions, thoughts, ideas you may have. Robinson Waste provides the lowest porta potty rental price quotes with the most reliable portable toilet service in or around the Bass River Township area. Your phone call will be answered by one of our porta potty professionals who will help you. Just let us know what you’re plans are, how many people will be using the facilities, where and how long you’ll need to rent the porta potty. Need a dumpster rental? We provide Bass River Township dumpster rentals too! Fill out the form below or call 856-931-3133 for friendly, local Southern NJ assistance. © Jack Robinson Waste Disposal Service, Inc. All Rights Reserved.